Our success depends on our ability to work together—including making sound decisions that lead to committed action. Despite our best efforts to engage and inform others, effective decision-making is often elusive. When decision-making and communication processes don’t work well, they eat time, energy and money, cause frustration and resentment, and sabotage even the best plans. 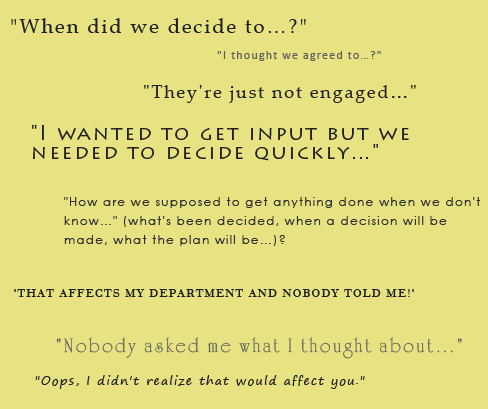 These breakdowns can look like complaints that decisions weren’t clear, second-guessing decisions that were already made, people not having the information they need to do their jobs, silo-thinking, conflicts between being inclusive and being efficient, trouble making decisions, etc. Set next steps for strengthening decision-making and communication within your team or organization. Tasha Harmon is a facilitator, consultant, trainer and coach with over 25 years in the nonprofit sector as a staff member, manager, executive director, board member, volunteer, and consultant. She has helped found four nonprofit organizations. Tasha teaches on a wide variety of topics related to decision-making, communication, problem-solving, facilitation, board and staff development, and change management. Paula Manley is an experienced nonprofit executive director, program director and board leader who brings this extensive practical knowledge to her work a consultant, facilitator, and educator. Paula’s primary focus is helping organizations develop board and staff leaders, embrace diversity, engage in participatory planning, and navigate leadership transitions. She is the principal of Paula Manley Consulting and co-founder of The Learning Commons, a nonprofit that presents intensive leadership institutes for nonprofit leaders throughout the U.S.
Making It Work can be done as a one-day workshop or a series over several sessions. It can also be included in a larger facilitation, training or coaching package. The cost varies based on the number of participants and trainers, and the amount of customization needed, and whether it is part of a larger package. The cost for the stand alone, one-day version with only basic customization starts at $1600. Call or email me if you are interested in knowing more or discussing a workshop or training. I look forward to talking with you.